Forgive me for stating the obvious, but it’s hot. Almost too hot to cook. I’ve spent the last few weeks eating more salads than I can count, and while the bounty of summer vegetables provides me with crisp, crunchy, and cold salad ingredients, there is also an abundance of veggies I love that demand cooking. Like our friends from the squash family: zucchini and eggplant. Some people get tired of these vegetables by mid-summer – you can find loads of them at supermarkets and farmers markets, and if you belong to a CSA like my friend Tracie, you’ll be sick of zucchini before the end of July. But it’s cheap and versatile, and I like that. I like zucchini ribbons, zucchini fritters, zucchini sticks and zucchini bread. But my favorite way to eat zucchini in the summer months? Grilled. I was too hot (and quite frankly, too lazy) to hoof it up to my roof to use the charcoal grill, so instead I went to the cupboard and pulled out a little number I scored for Christmas. 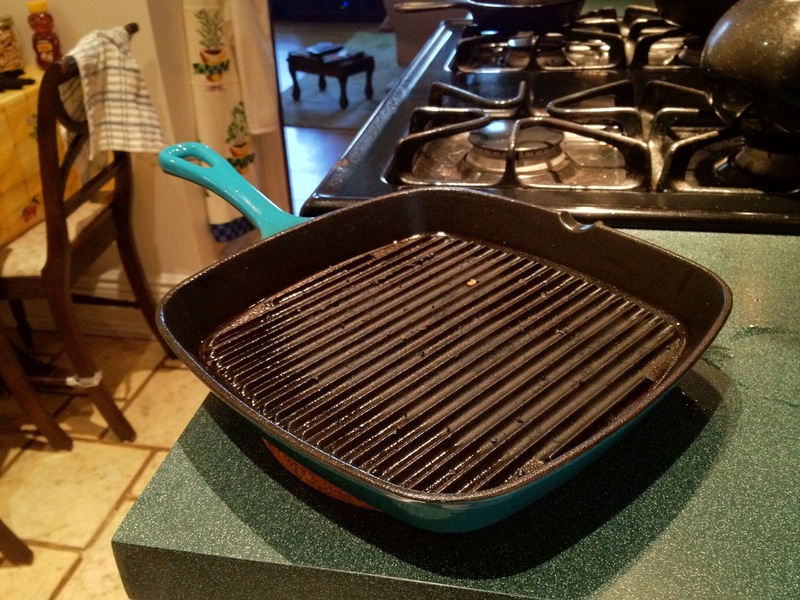 Le Grille Pan (post-grilling, pre-cleaning). Armed with 2 large zucchinis and a ripe eggplant, I set about the business of slicing and marinating – olive oil, balsamic (a light touch), salt and pepper. While the veggies marinated, I heated the grill pan (coated with olive oil spray) for 5 minutes at medium high heat. I cut the eggplant into 1/2-inch thick slices; the zucchini into 1/4-inch slices. 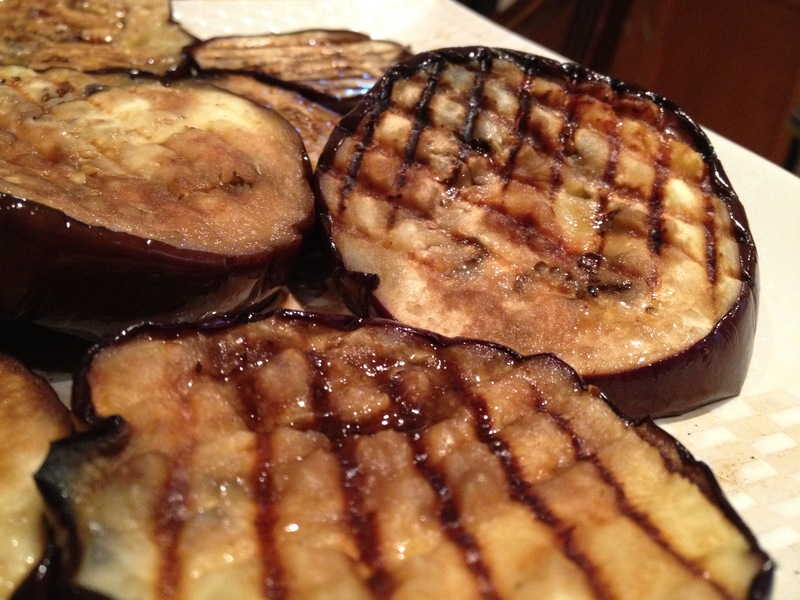 At this width, the eggplant are perfect when cooked 4-5 minutes on each side, and I like to rotate the slices as they cook to get these pretty grill marks. 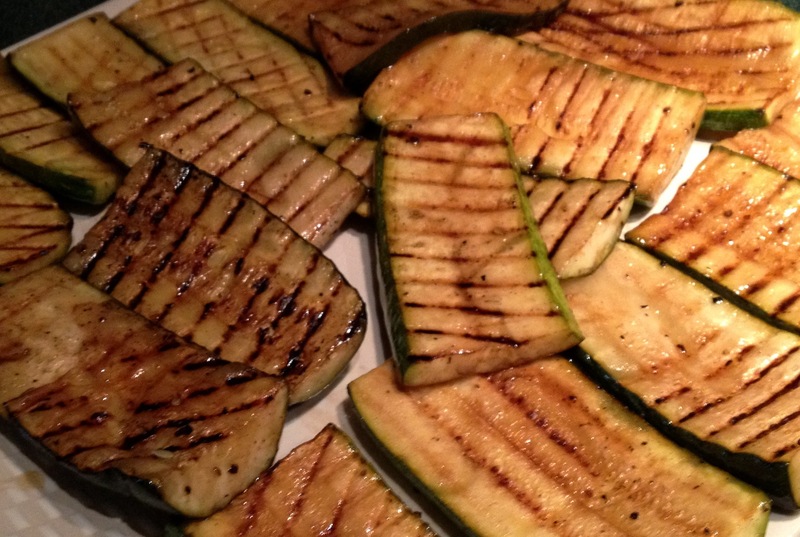 Since the zucchini are sliced thinner, they only need to cook about 3 minutes on each side. And 2 zucchini yielded enough slices to serve 4 as an appetizer. I still had another eggplant and 2 more zucchini in my fridge, plus some leftover tomato sauce (thank you, Mommy!). That gave me another idea: sauce—but a sauce that would be delicious hot on pasta, cold as a dip, or room temperature to enjoy with cheese and bread. This sauce gets its punch from lots of chopped garlic (seven cloves!) and hot pepper flakes. Yum yum yum. This dish came together in under a half hour. First, peel and chop some garlic cloves (however many you like). Then cut the eggplant (1) into 1″ cubes. Heat a large skillet over medium high heat and add olive oil to the pan. Give it a minute or two, and then add the garlic. Let the garlic cook for a couple minutes before adding the eggplant, about a teaspoon of kosher salt and 2 tablespoons of water. Stir everything together, reduce heat to medium and cover. 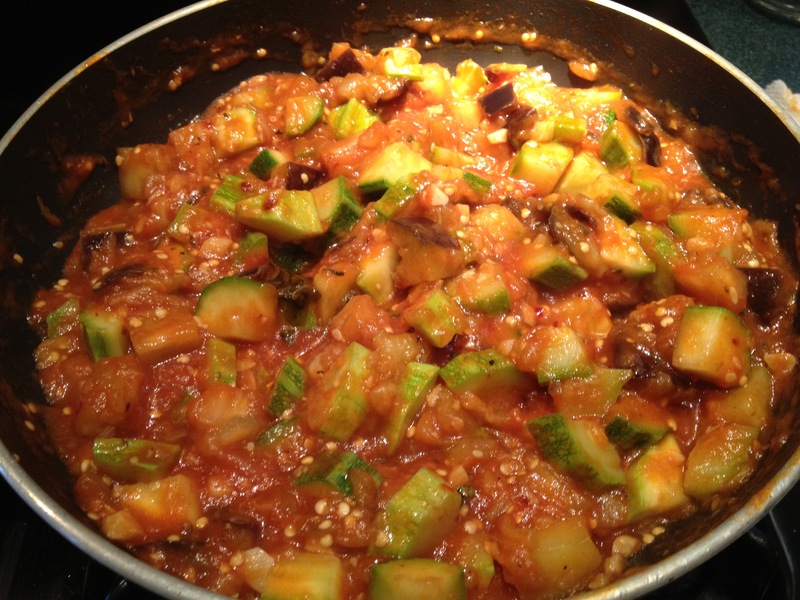 Cut the zucchini (2)into 1″ chunks, and add to mixture once eggplant has started to soften and release liquid. Stir and cover again. Cook for another 6-8 minutes. Once the zucchini has begun to soften a little (but still retain its bite), add tomato sauce—I had about 3/4 of a cup—and stir. Add a pinch each of the following: hot pepper flakes, dried oregano and basil, plus salt and black pepper to your taste. Allow the mixture to cook uncovered at medium heat for another 2-3 minutes, and then that’s it. You’re done. 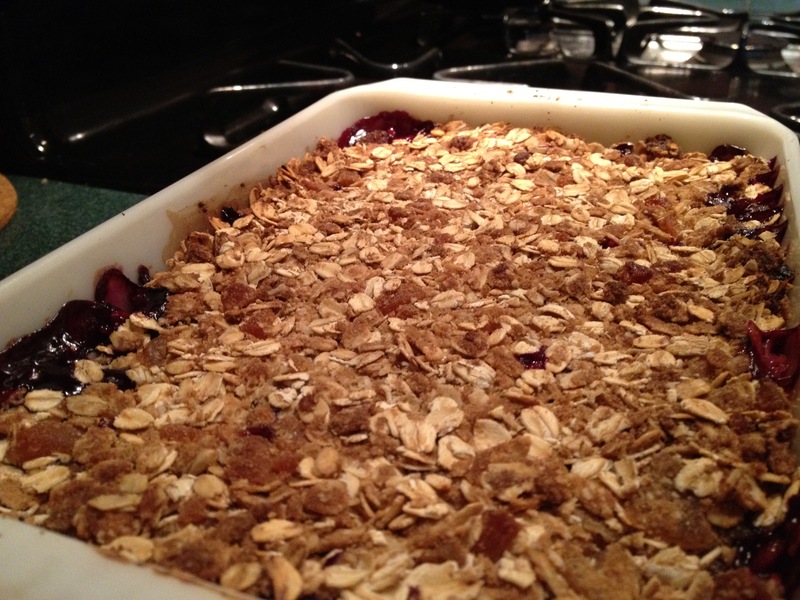 The last thing I made today was a fruit crumble (You can find my method for how to make one here). As I’ve said before, fruit crumbles are endlessly adaptable—which I’ve learned from making a new every Sunday for the last month, each time with a different combination of fruits. Today I used a pear, a peach, a pint of blueberries and a half-pound of strawberries. I also added a new element to the crumble topping: chopping candied ginger. I’ll post a picture of how this baby looks when it’s served properly (a juicy mess in a bowl, topped with ice cream), but here’s what it looked like right out of the oven. Again, only Smell-O-Vision would do this thing justice. This entry was posted in Musings, Recipes, Savory and tagged dessert, dinner, easy, eggplant, fresh, fruit crumble, grill, grill pan, grilled veggies, healthy, light, sauce, summer, tomato, zucchini. Bookmark the permalink.